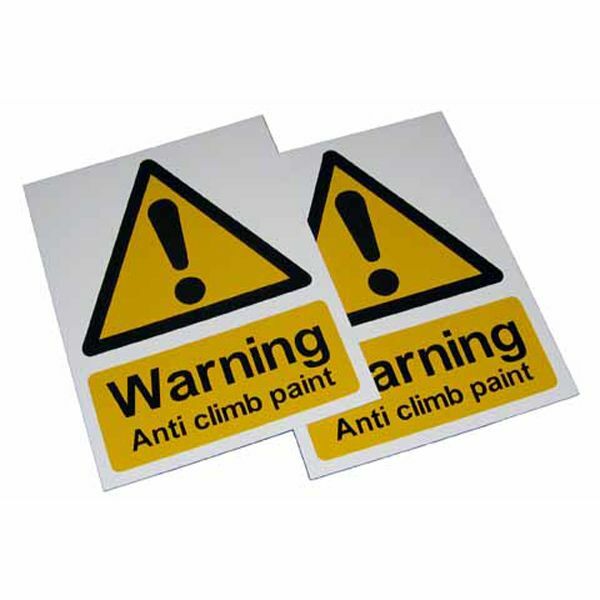 When using anti climb paint it is essential that appropriate warning signs are displayed wherever the anti-climb paint has been used. Appropriate warnings need to be in place in order to avoid being sued in civil court. 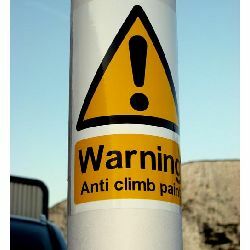 Anti climb warning signs must be simple enough to be visually understood by young people as they are those most likely to attempt climbing. Our range of effective anti climb warning signs fully comply with the anti climb paint recommendations provided by the police force. It`s important to ensure that signs are prominently displayed so that they are easily seen by anyone approaching the protected area. 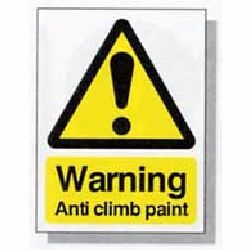 For a straight, linear barrier (such as a wall) which has been coated with anti-climb paint it is recommended that anti climb paint warning signs are presented at a maximum spacing of every 3 metres.